Watch The Mind of a Chef, Episode 2: Pig on PBS. See more from The Mind of a Chef. 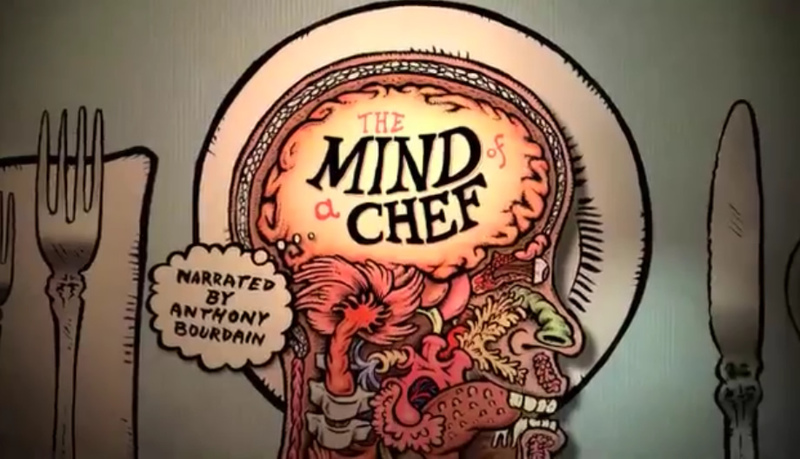 Watch The Mind of a Chef, Episode 3: Memory on PBS. See more from The Mind of a Chef. You can watch the other 5 episodes HERE! Chang makes instant ramen dishes and tsukemen; takes a trip to Japan for a bowl the original tsukemen, a visit a noodle factory, and Harold McGee explain alkalinity. This episode explores Chang’s relationship to the pig. He travels to San Sebastian to discuss pork bushi. He makes pork belly, and tonkotsu and travels to Montreal with his pal Aziz Ansari for a fried boloney sandwich.. This episode explores Chang’s past; dishes from childhood, summer eating, his time in Japan, and golf. This episode is all about Spain’s influence on Chang’s career. He visits with some of his idols- Juan Mari Arzak and Andoni Aduriz, makes fideos, salt cod omelet and a sponge cake from chef Albert Adria. There is something rotten in David Chang’s kitchen and that’s a good thing. Rotten is delicious; katsuibushi in Japan, XO sauce, rotten bananas with Chef Christina Tosi, and Kimchi. Chang hangs out with one of his best friends- who happens to be the world’s top chef- Rene Redzepi. Dishes in this episode are deceivingly simple; Chang travels to Japan for some Yakitori and high-end sushi, and his pal Daniel Patterson makes beets. It’s gluttonous goodness in this episode; over the top indulgence with Joe Beef chefs Federic Morin and David McMillian’s fois gras sandwich, a whiskey tasting Mayhem with Chef Sean Brock at Buffalo Trace in Kentucky and the classic dish Hot Brown served up three ways. Chang makes eggs with his chef pals; Wylie Dufresne, Daniel Patterson, Rene Redzepi, and makes his Ko egg. Chang travels Tokyo and Kyoto. This episode is all New York with the Torrsi boys, oysters, carrot dashi, and farming. Plus Chang visits native New Yorker Ivan Ramen in Tokyo where he is making ramen that is taking the city by storm. This episode explores the idea of fresh in the kitchen; instant broth, pea agnollini, fresh and aged steak with Chef Tien and Ike Jime with Dave Arnold and Chef Murata in Kyoto. This episode is all soy; Chang visits tofu and miso factories in Japan, Chef Christina Tosi makes Burnt Miso. Chang’s protégé Christina Tosi makes corn cookies three ways and her three layered Arnold Palmer Cake, Chef Burns makes ice cream and Chang goes strawberry picking. Chang profiles regional BBQ in North Carolina, Texas, and Kansas City plus the other-worldly smoky bacon from Allen Benton in Tennessee. Chang cooks and goofs around with his friends; Peter Meehan in Japan, Laurant Gras, Set Bains, and Rene Redzepi in Copenhagen.